Angel's Monte Carlo Is A Shoot-'Em-Up Tribute To Mexican History. 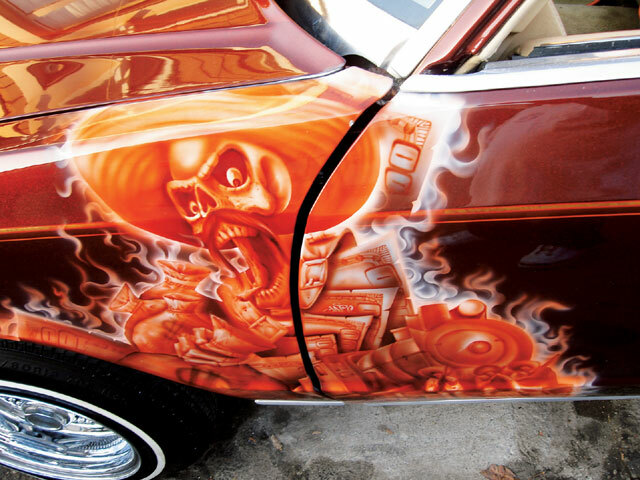 Angel Romero of Santa Ana, California, was like most of us who own a lowrider, dreaming of one day being featured in Lowrider Magazine. We spotted his ’84 Chevy Monte Carlo all done up and ready to go at last year’s Super Show. 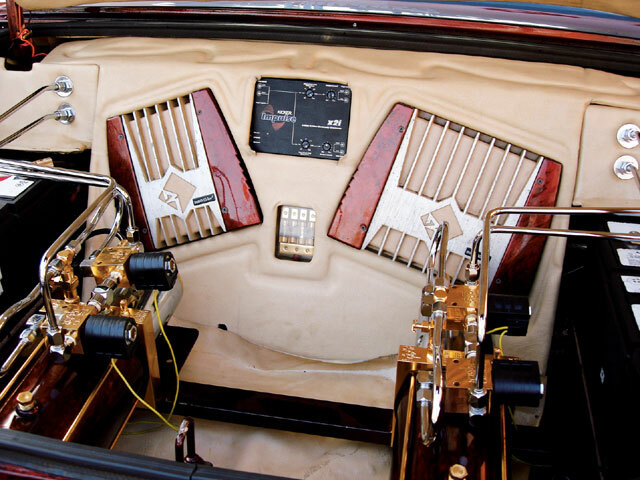 The Orange County ride featured some of today’s hottest custom trends, including a set of vertical Lambo doors. Talking to Angel, we found out that he actually got a head start on this ride as he bought it already painted from an individual in the San Fernando Valley. The previous owner was in a little bind and really needed to sell the car quick. 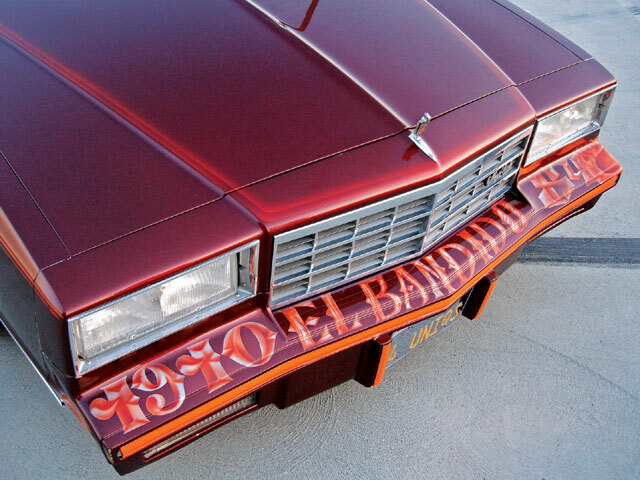 The Monte had been modified with a Hollywood top and had been painted by Javier at Mexico Auto Body in South Gate, California, and it was ready to be put back together. That’s when Angel stepped in and bought the car with the help of his parents. The G-body made its way back to its new home in Santa Ana. 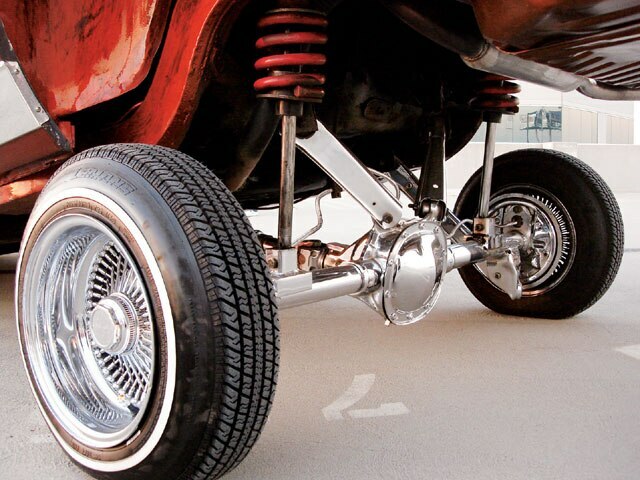 A ton of work was done to “El Bandido” over the next few years, including the Lambo doors and undercarriage, which was modified and fully chrome plated. 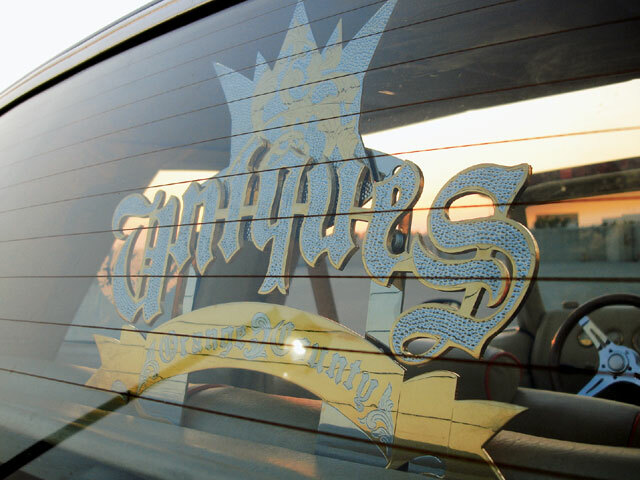 The chrome pieces were dipped by “Big Rich” at Central Driveshaft in Los Angeles, California, while Juan at La Habra Plating in La Habra, California, took care of the gold accents on the vehicle. 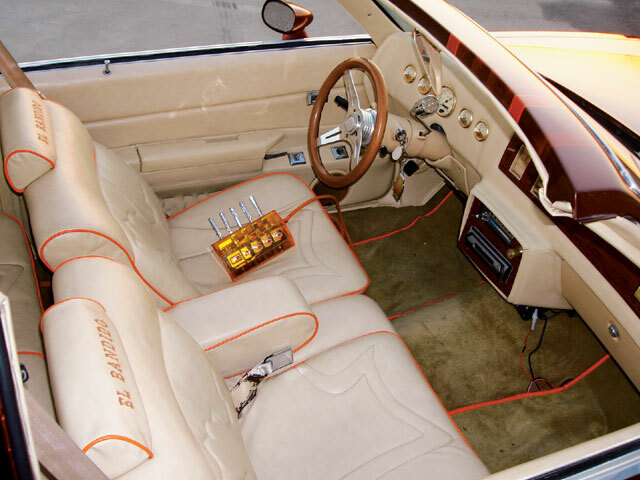 With a full-chrome undercarriage, the Monte was ready to hit the boulevard and can be seen cruising around Orange County since its completion. Angel couldn’t have accomplished his goal of being featured in the magazine without the support of his family, who always go the extra mile for him. Angel tells us that he’s ready to redo his car one more time. Good luck, Angel, and we know that with the support of your family the next El Bandido should be even more of a shoot-’em-up, take-no-prisoners lowrider. El BandidoOwner: Angel RomeroVehicle: ’84 Chevrolet Monte CarloCity/State: Santa Ana, CaliforniaClub: Uniques C.C. Body/Paint: The Lambo doors were installed by “Chino” at C&L with further work done by Luis and Saul at Wild Child Customs. Mexico Auto Body in South Gate, California, sprayed the House of Kolor root beer brown paint, and “Japo” of Pomona, California, applied the Mexican Revolution-themed murals. Interior: Giovanni Upholstery in Santa Ana took on the task of adding a custom touch to the interior. Giovanni incorporated the Mexico logo into the tan vinyl seats. Sound System: Angel installed a Rockford Fosgate system. Setup: A two-pump Red’s Hydraulics setup was installed by Angel and his friend with six 31-series batteries for power. 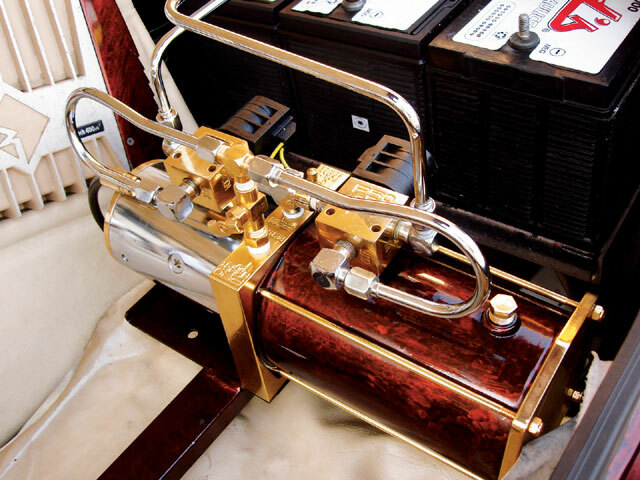 To help the car lock up high, a pair of 8-inch cylinders were installed “to the nose” and 18-inch cylinders with an almost full stack of coil can be found in the rear.